O God, by whose favour we celebrate the glory of blessed Saturninus, thy Martyr, grant that we may be assisted by his merits. Through our Lord Jesus Christ, thy Son, who liveth and reigneth with thee, in the unity of the Holy Ghost, God, world without end. Amen. St. Saturninus went from Rome by the direction of Pope Fabian, about the year 245, to preach the faith in Gaul, where St. Trophimus, the first Bishop of Aries, had some time before gathered a plentiful harvest. 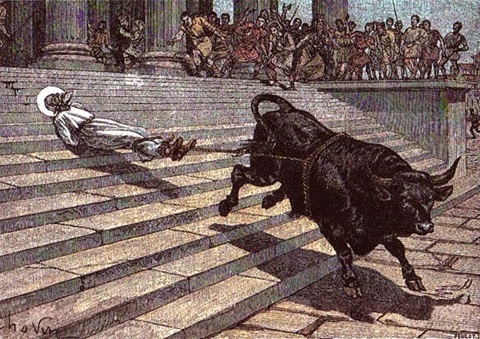 In the year 250, when Decius and Gratus were consuls, St. Saturninus fixed his episcopal see at Toulouse. Fortunatus tells us, that he converted a great number of idolaters by his preaching and miracles. This is all the account we have of him till the time of his holy martyrdom. The author of his acts, who wrote about fifty years after his death, relates that he assembled his flock in a small church; and that the capitol, which was the chief temple in the city, lay in the way between that church and the saint's habitation. In this temple oracles were given; but the devils were struck dumb by the presence of the saint as he passed that way. The priests spied him one day going by, and seized and dragged him into the temple, declaring that he should either appease the offended deities by offering sacrifice to them, or expiate the crime with his blood. Saturninus boldly replied, “I adore one only God, and to him I am ready to offer a sacrifice of praise. Your gods are devils, and are more delighted with the sacrifice of your souls than with those of your bullocks. How can I fear them who, as you acknowledge, tremble before a Christian?” The infidels, incensed at this reply, abused the saint with all the rage that a mad zeal could inspire, and after a great variety of indignities, tied his feet to a wild bull, which was brought thither to be sacrificed. The beast being driven from the temple ran violently down the hill, so that the martyr's skull was broken, and his brains dashed out. His happy soul was released from the body by death, and fled to the kingdom of peace and glory, and the bull continued to drag the sacred body, and the limbs and blood were scattered on every side, till the cord breaking, what remained of the trunk was left in the plain without the gates of the city. Two devout women laid the sacred remains on a bier, and hid them in a deep ditch, to secure them from any further insult, where they lay in a wooden coffin till the reign of Constantine the Great. Then, Hilary, Bishop of Toulouse, built a small chapel over this his holy predecessor's body. Silvius, bishop of that city, toward the close of the fourth century, began to build a magnificent church in honour of the martyr, which was finished and consecrated by his successor, Exuperius, who, with great pomp and piety, translated the venerable relics into it. This precious treasure remains there to this day with due honour. The martyrdom of this saint probably happened in the reign of Valerian, in 257. In the spirit of the primitive apostles of nations we see what that of a true disciple of Christ ought to be. What was a Christian in those happy times of fervour? He was a man penetrated with the most lively sentiments of his own nothingness; yet courageous and magnanimous in his humility; disengaged from and raised above the world: crucified to his senses, and dead to himself: having no interest but that of Jesus Christ; mild, affable, patient, full of tenderness and charity for others, burning with zeal for religion, always ready to fly to the remotest parts of the globe to carry the light of the gospel to infidels, or to die with the martyrs in defence of the divine truth. Such a spirit and such a life, is something far greater and more astonishing than any signs of external miracles.